Closeup detail of the traditional architecture of a building at the Forbidden City in Beijing, China. 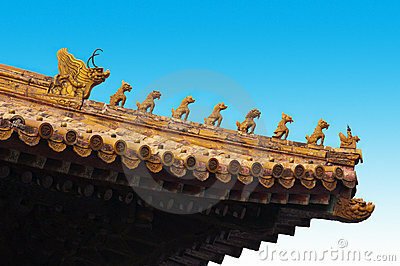 Here you can see roof carvings of dragons and other mythical creatures. The old Imperial Palace and other structures are a popular tourist attraction for people who travel to the far east and orient to experience new traditions and culture.